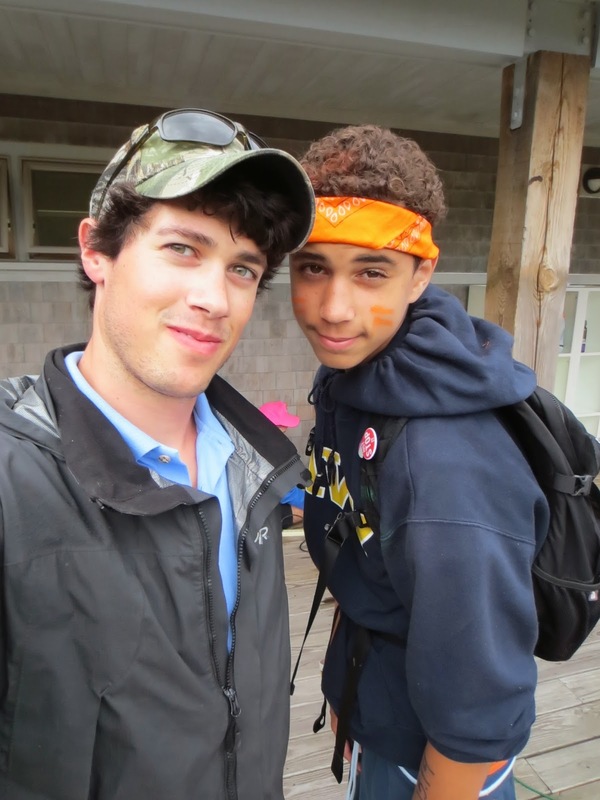 This past Thursday, was the last day of the first session at Camp Harbor View. Far from the normal schedule, the day was filled with fun events to culminate the session, and send the kids off into the rest of summer. Our time there today started at the lunchtime barbecue. All of the tables from the great hall were pulled out into the fields out front. Hotdogs, hamburgers, ice cream and snow cones were all made available by the staff. Music was playing, leading to a whole lot of lively dancing and fun. While this type of cookout happens every Friday at the camp, the significance of the last one could be felt, and everyone danced and sang just a little bit harder. As the rest of the day would be filled with activity, lunch hour provided us the last real opportunity to say our goodbyes to all of the campers that we had come to know over the session. Me and one of my friends from the last two years. Being an individual in a camp of over 500 likely doesn't leave a whole lot of room for personal recognition, but the days next event would give any willing kids the opportunity to show their skills. From singing and dancing, to Capoeira and miming, this talent show had it all. It was not only fantastic to see what talents the campers had to offer, but also to witness the massive outpouring of support for everyone who put them on display. The crowd at the talent show. After the exceptional showing of talent the camp headed down to the great hall for the days last event, a slide show of photos from the session. Despite the upbeat nature of the slide show, an air of sadness hung in the air. You could tell that campers and counselors alike did not want to part ways. Still, it was great to see all of the awesome stuff that the campers had done over the course of four weeks. As the slideshow drew to a close campers began saying their final goodbyes to the friends and councilors that they had shared so much fun with. Tears came to more than one set of eyes at the thought that this chapter of the summer was closing. The friendships forged at CHV will last a lifetime, and I am sure that the kids will find ways to keep in contact throughout the year despite going to different schools and living in different areas of Boston and its surrounding cities. I know that I have said this before in some of my previous blogs, but I feel it prudent to reiterate that Camp Harbor View truly is a special place. The opportunity to form such deep and meaningful friendships in such a perfect setting, located in the heart of Boston Harbor is unique. The love and appreciation for this opportunity can be seen on the faces of each camper as they say farewell, at least until next summer.